The anniversary of De Gaulle’s London address to ‘Free France’. At this time of year the Paris district of Montparnasse, dominated by the huge 1970s tower which bestrides the railway station, has a special significance for the French. On the square in front of the old railway station, in the afternoon of August 25th, 1944, General de Gaulle was handed the document, signed by the German commander of Paris, agreeing to give up the German garrison. Paris was liberated. But the space in front of the new station is not called the Place du 25 août 1944 as one might expect. It is the Place du 18 juin 1940. The June 18th speech is seen as a turning point in French national history. 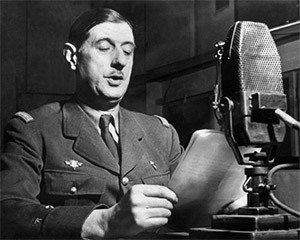 The ‘appel’ of ‘Moi, General de Gaulle, à Londres’ was the starting point for la France libre, Free France, a France which did not have to feel dishonour at the course of the war. It was the hope that the Liberation of Paris on August 25th, 1944, was to fulfil. But while the ‘appel’ is seen as de Gaulle’s first act in his construction as a statesman, French pupils are taught that this event could not have taken place without the support of Churchill and the British government. Allowing de Gaulle to speak as ‘France’ on the BBC was critical for the development of Free France. But do they know that, when Britain stood alone, Churchill was desperate for the French contribution to the war effort, which included the French fleet and the resources of the French colonies in Africa, the Middle East and the Pacific and trading establishments in India? That he had spent much of June initially trying to rally the failing government of Paul Reynaud, with proposals that even included the idea of an Anglo-French Union, consisting of a single government and parliament, and a single citizenship? Do they know that, as one of de Gaulle’s recent French biographers puts it, ‘Churchill’s predator’s eye had recognised in General de Gaulle the man of destiny?’ and made a daring decision with consequences which were to contribute to Hitler’s defeat, and which were to lead de Gaulle to the presidency of a France that was once more a world player? Late on June 17th, Churchill took the decision that it was de Gaulle, a junior and largely unknown French general – without an army, who should be recognised as speaking for the French nation, and not Reynaud’s successor, Marshal Pétain, the hero of the First World War, who declared the French armistice of the Second World War. A suspicious War Cabinet was brought round and acquiesced in the decision to give de Gaulle access to the BBC. The broadcast, not recorded by the BBC, was made on the evening of June 18th. The sixtieth anniversary of June 18th is being marked both sides of the Channel. In France, where ‘le 18 juin’ is so engraved in French memory that there is no need to affix it to the year 1940, a new museum has been created. Le Musée de la France libre is housed within Paris’ Army Museum in Les Invalides. President Jacques Chirac was due to inaugurate it on June 18th. Its contents evoke de Gaulle, Free France and France at arms during the Second World War. The exhibits, appropriately, include the BBC microphone used by de Gaulle to speak to the French. The British section of the Franco-British Council, the organisation created in 1972 by President Georges Pompidou and Prime Minister Edward Heath, on the eve of the UK’s entry to the EEC, is also marking the anniversary. It is publishing a pamphlet initiated by Douglas Johnson and Anne Corbett, to commemorate the extraordinary week in June 1940, which culminated in Churchill’s recognition of de Gaulle as the voice of France. The pamphlet contains souvenirs by Maurice Druon of the Académie Francaise and Pierre Lefranc, who both joined de Gaulle in London. The historian, Jean-Louis Crémieux-Brilhac, who was also with de Gaulle in London, and who has just completed the Pléaide edition of de Gaulle’s writings, contributes a historical assessment of the ‘le 18 juin,’ alongside fellow French historians François Bédarida, author of a study of Churchill, and Maurice Vaïsse, whose most recent book on de Gaulle is entitled La Grandeur. Among British historians, Philip Bell traces the story of an extraordinary week which led to the broadcast, Alistair Horne writes on Mers el Kebir, Martyn Cornick on the role of the BBC. Helen Drake, lecturer in French and European studies, assesses the legacy of de Gaulle in France’s current strategy on Europe, journalists Jane Marshall and Anne Corbett write on what French and British schoolchildren are taught about this period. De Gaulle himself, looking back on a life which had made him a world statesman, wrote, not long before his death, to one of the French correspondents based in London who became a ‘French voice’ of the BBC: ‘Free France was the finest thing we ever did.’ It is hoped that this pamphlet will reveal to a wide British readership the de Gaulle of ‘le 18 juin,’ the solitary figure who refuses simple categorisation, and who, on historical grounds, should go down in British history as someone far greater than the man who said ‘no’ to British entry to the EEC. A Day in June: Britain and de Gaulle, edited by Anne Corbett and Douglas Johnson, is published by the Franco-British Council British section.